1. Angus MacLeod jr. 2. Sandy Robertson jr. 3. Stewart Salmond 4. John Dickson 5. Alex Veitch 6. Colin Stewart (Bass Drum who emigrated to Canada) 7. George Roger 8. Ewen Reevie 9. Donald MacLeod 10. Sandy Robertson snr. 11/11/06 My thanks go to Iain MacLeod, Pipe Major of Jersey Caledonian Pipe Band. Iain is the son of Angus MacLeod junior and was able to fill in some of the names in the picture and also correct some errors. It is also nice to know that Iain's son, Alisdair, is now a fine piper carrying on the tradition of "The MacLeod". We are still looking for the remaining backgrounds of these Pipers. In 1941, Angus Macleod junior was teaching a number of boys and men in the City, helped by his father and brother, Angus senior and Donald. That year (1941) Angus junior was asked to form a band in the Dundee Air Training Corps. This ATC band continued until the end of the War. 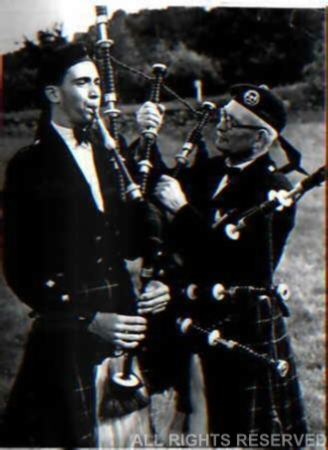 After the War, Angus junior and Donald Macleod decided to form a senior band, and from this the Macleod Pipe Band was born with Angus as Pipe Major. 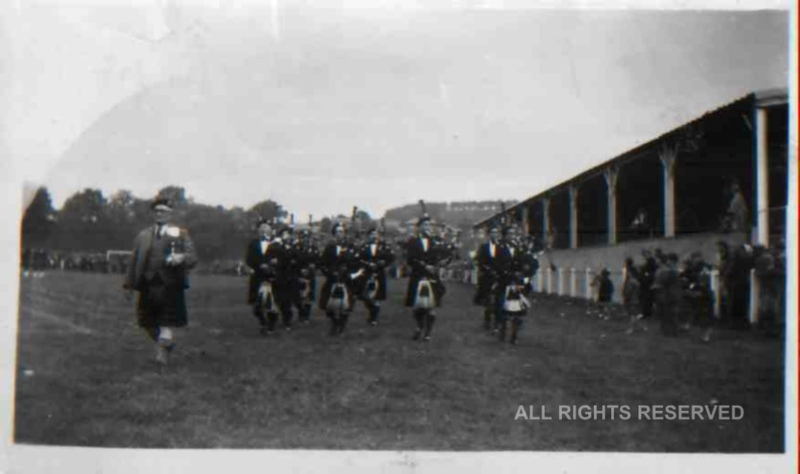 Thus began one of the most influential Pipe bands ever to exist in Dundee. From the ranks of this band came solo and band players who would grace the field of competition, and it was with some "matter of factness" that observers would point out that "Och, of course he's good, he was in The Macleod"
This band, wearing the Ancient Hunting MacLeod, was at it's peak when the armed forces discovered their talent, which was outwith their grasp. In time, with National Service, all the young players were snatched away, and the band struggled to carry on. In 1958, Angus Macleod junior moved north on business and Donald felt he was too old to take over as Pipe Major. Angus senior died in December 1958 and so the band was finally put to rest . Here was a band whose members left their mark on piping, dating back to 1900. Angus Macleod senior travelled to Glasgow around 1906 where he took lodgings simply to receive tuition from John MacDougall Gillies. When he returned to Dundee, he set about passing on his knowledge to others to an amazing effect. Eventually, his sons took over that duty by teaching, and setting standards that many would have like to have emulated both then and now. Angus MacLeod junior. Son of Angus senior. Founder of the MacLeod Pipe Band. Senior Pipe Major and instructor to the British Armed Forces. Stewart Salmon junior To become Pipe Major of The National Cash Register Pipe Band, Dundee. George Roger To become Pipe Major of The National Cash Register Pipe Band, Dundee. Claude Miller One of the very few holders of the S.P.B.A. Advanced Certificates in Bagpipes and Drumming. 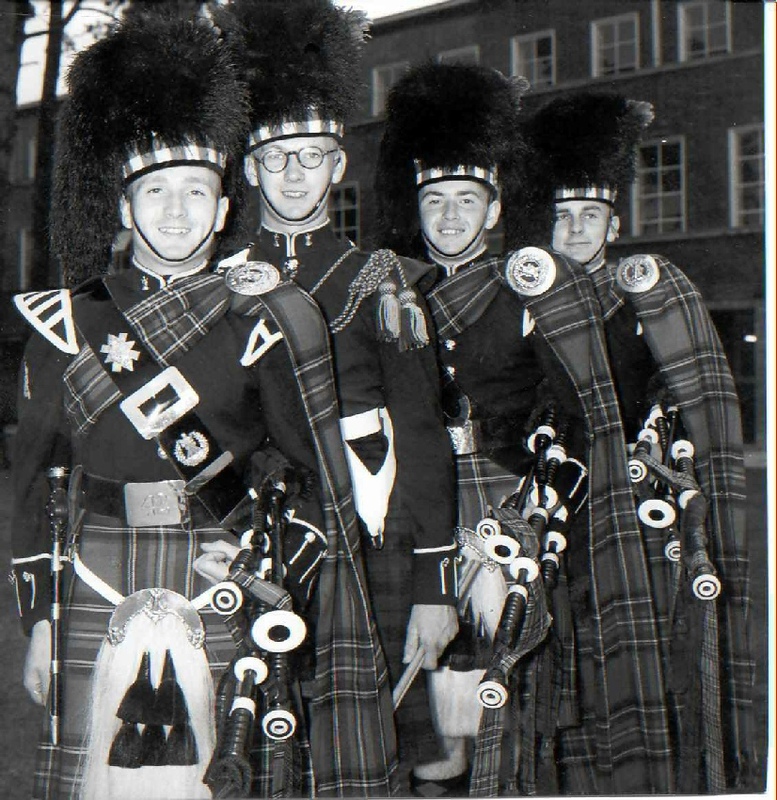 John Dickson junior Later became a member of Dundee City Police Pipe Band whilst a Station Officer with the Fire Brigade. James MacKenzie Founder of the MacKenzie Pipe Band, Dundee in 1919. James Sword Founder and Pipe Major of The City of Dundee Prize Pipe Band and also the Jute Industries Pipe Band. Bert Barron BEM Later St. Andrews University etc. Jimmy Gilchrist From Maryfield, Dundee. Jimmy Spankie Grampian TV presenter. Jack Lockhart Who became Pipe Major of The Bullionfield Paper Mill Pipe Band and later Bucksburn Bucksburn and District. It is certain that I have missed a few great names who have passed through their hands. Donald Macleod was not entirely finished though. Still a strong devotee of Piping, he became the Bagpipe Instructor to Dundee High School. This was a post he held for many years, and I remember visiting him in the mid 1970's and he was still going strong, producing pipers of quality. 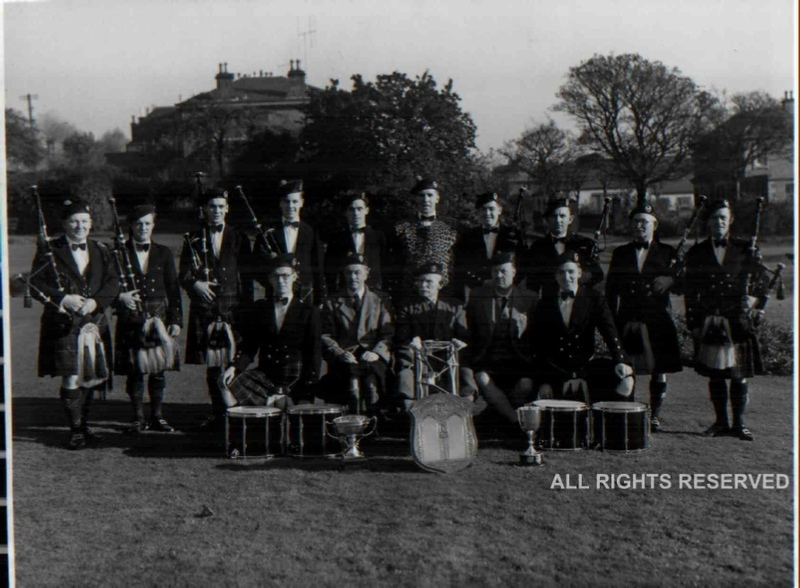 This second shot was taken in Blairgowrie in 1954 and show the MacLeod Pipe Band winning the Dundee, Perth and Angus Branch Championship.